I’ve been a bit remiss lately in keeping this site current and posting new photos (with the exception of the last few days). Things have been a bit hectic since the first of the year and while photo opportunities have not diminished, the time needed to process and post them has been more limited. I’m going to try to get a better and post more frequently, sharing both images and a few comments or suggestions along the way. The photo at the end of this post was taken earlier this year during a short vacation to Florida in an attempt to get away from the winter weather in St. Louis. While the weather was better, it was not quite as warm as we expected. Even so, we got a number of good photos. 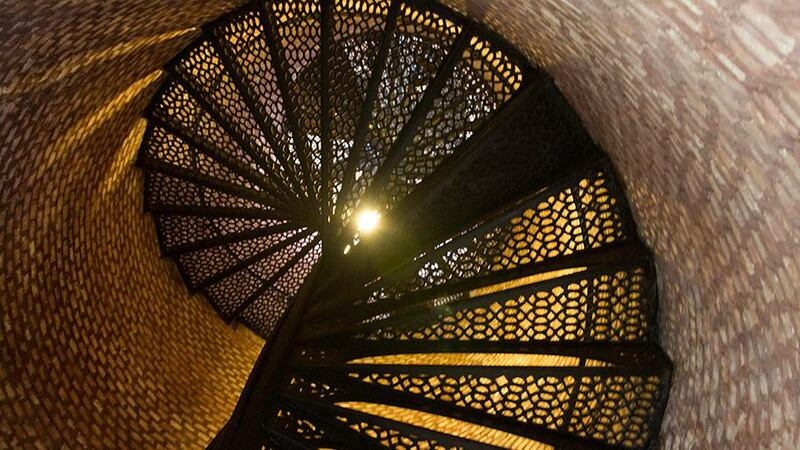 This shot was taken in the lighthouse on Pensacola Naval Air Station looking up the circular stairs from the lighthouse base. I really liked the resulting patterns and hope you enjoy them as well. The unusual cropping was done so that the image could be used as a cover photo in Facebook. Before adding the image, I wanted to recommend another photographer’s site to you. On the KelbyOne show The Grid yesterday afternoon the featured guest was Stacy Pearsall, Staff Sergeant, US Air Force, Retired. Stacy was a combat photographer while in the Air Force and served in a number of locations including the Middle East going on missions with both Army and Air Force units. As a retired service member I salute Stacy for her work both while on active duty and her current project photographing veterans around the country (including some four -legged veterans, the military service dogs). If you have a chance, take a look at Stacy’s web site. I hope you will find it interesting.